The truth about the legal status of the orangutan Sandra in Argentina has been elusive and hard to determine. The freedom of the orangutan is being sought from forced captivity at the Buenos Aires zoo as an ape person entitled to freedom and humane treatment. 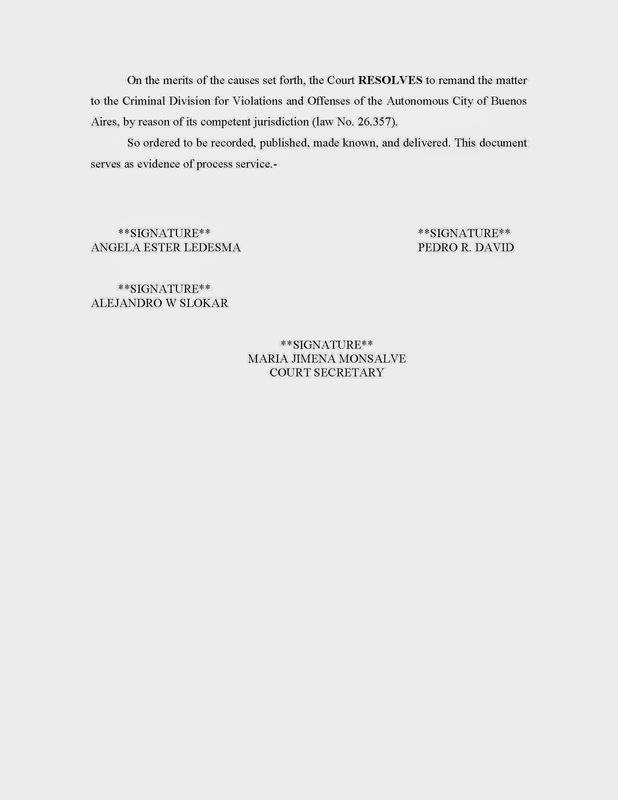 But the specific legal details of what is actually being accomplished in court in Argentina have been confused and blurred, leading to misunderstandings in the media. The main issue is whether new legal rights have been won in the court case for the orangutan Sandra. It seems that the potential for new rights is being confused with whether new rights have technically been won yet. 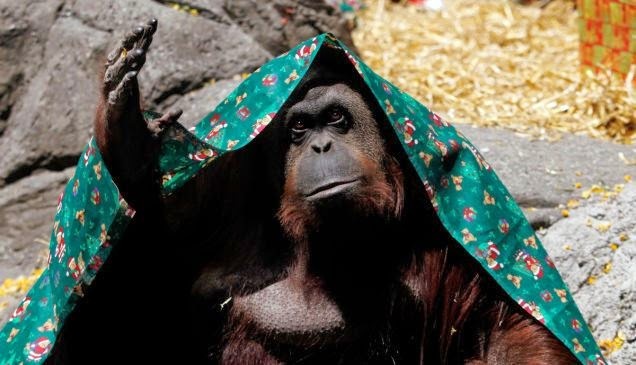 Sandra is an orangutan living in Buenos Aires Zoo. On December 18, 2014, a hybrid orangutan named Sandra, born in a zoo in Germany in 1986, was termed by the court in Argentina as a "non-human subject" in an unsuccessful habeas corpus case regarding the release of the orangutan from captivity at the Buenos Aires zoo. 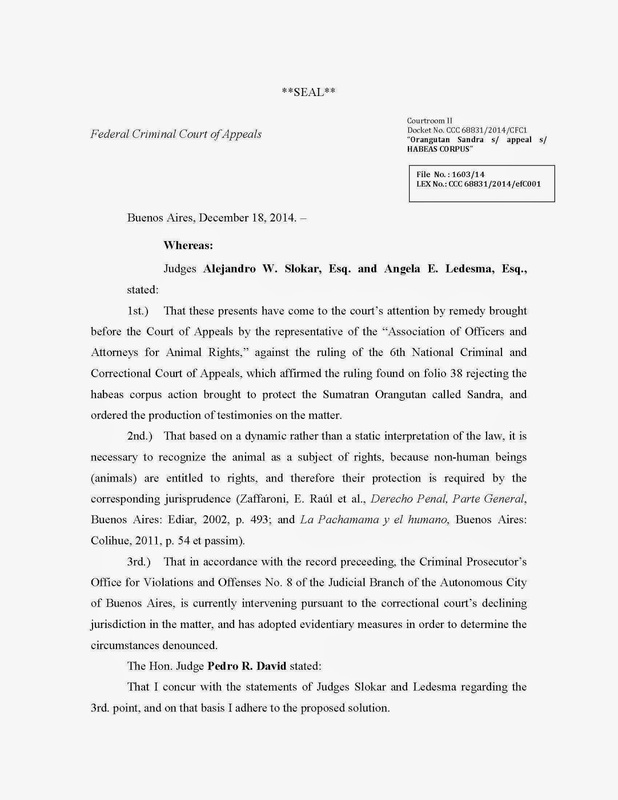 The decision turning down the habeas corpus application also led to the court's direction to prosecute alleged cruelty by the zoo through the prosecutor's office in Buenos Aires in 2015. Meanwhile, the status of the orangutan as a "non-human subject" is uncertain and needs to be determined by the court. It was widely reported in the media that Sandra was declared a "non-human person" by the court on December 18, 2014, but that was a legal interpretation of "non-human subject" by the association of lawyers for animal rights in Argentina, ALFADA, that is pursing court cases on behalf of Sandra. In most legal jurisdictions in the world, an animal is considered an object without rights, or property capable of being owned, bought and sold, not a subject with rights. In most jurisdictions, there is also a legal distinction between a "person" and a "human being." For instance, a corporation can be a legal "person" without being a "human being." In 2015, ALFADA is pursuing the release of Sandra from the zoo and a legal decision to give her status as a "person" through an amparoapplication in court, which will raise the issue of the legal status and rights of the orangutan under the Codigo Civil Argentio or Argentina Civil Code, under articles 30, 31, 32, 51, 52, 56 and 57. The civil code has two relevant categories, "personas de existencia visible" (visible existing persons), applied to corporeal entities such as minors and disabled persons, and "personas de existencia ideal" (ideal existing persons), applied to legal incorporeal entities such as a corporation given "person" status in the law. Article 51 defines "personas de existencia visible" as having "signos característicos de humanidad." There is no "non-human person" category in the code. Little has been published about the background of Sandra. She has a daughter who was taken from her in the zoo in Buenos Aires and sent to an unknown location. The issues are unresolved of where Sandra would be sent if ordered released by the court and how that would be funded. This blog is the work of SHAWN THOMPSON, writer, university professor and author of the 2010 book THE INTIMATE APE: Orangutans and the Secret Life of a Vanishing Species. Shawn is now continuing to spread the good word about orangutans and the other apes any way he can. He is member of the board of Gary Shapiro's charitable foundation The Orang Utan Republik and will help writers and organizations promoting orangutans. He is also available to speak without a fee to any group that is interested in orangutans. Shawn lives in Kamloops, British Columbia. When tiger moms go ape: why so much strife about the mystery of raising the kids? Read the judge's decision that the orangutan Sandra is a "non-human person"
The perfection of life with orangutans: Are you getting what you need too? Musical apes: Should we be surprised that they can get the beat? photos and written material are copyrighted by the author listed on the particular blog. Simple theme. Theme images by konradlew. Powered by Blogger.